All of our belts are bench made by hand using the finest USA grade A leather in our saddle shop. our belts will provide years of enjoyment. Normally order the next size up from your pant waist size. Custom sizes are available by order. Made from the finest USA grade A leather by hand in our shop. We hand tool our belts and hand finish each one to insure you get the finest belt available. Each one is fully lined and stitched. 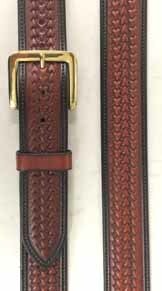 TIPS hand tooled Double Rope belt is hand made in our saddle shop. Each belt is carefully selected from the best part of the hide, tooled lined, sewed and hand finished to give you the finest belts available. TIPS Chestnut Arrowhead Basket Belt. Hand made in our saddle shop using the finest leathers. We hand finish each belt to give it that special feel and to insure you will enjoy many years of service. size 30 #103074 $165.00 Buy! size 32 #104427 $165.00 Buy! size 34 #103077 $165.00 Buy! size 36 #103078 $165.00 Buy! size 38 #103075 $165.00 Buy! size 40 #103076 $165.00 Buy! size 42 #104428 $165.00 Buy! size 44 #104429 $165.00 Buy! size 46 #104430 $165.00 Buy!